I never ever leave London’s Brixton market without a backpack fully laden with food. Infact, I buy my backpacks solely on how much ‘salone food’ I can fit in to them. Style – that don’t matter. So on my last trip to Brixton, I loaded up on 6 tins of coconut milk, 1.5 kilo of cashew nuts, 2.5 kilos of rice flour, 12 packets of plantain crisps (mini chefs are obsessed with these), 1 kilo of okra, 6 scotch bonnet chillis, 6 phone cards, 6 mangoes and 6 plantains. Sadly I had to leave behind the black-eyed beans, pistachios, water melon and star fruit. But only until the next time. I mean, how else would a girl to get her Sierra Leonean hit on a farm in Suffolk? Well one of those plantains made it into this super easy smoked mackerel, broccoli and plantain stir-fry. The sweet plantain really worked well with the salty smoked mackerel. The quantities in this stir-fry recipe is a guide. You can ignore the fish and make this as a plantain and broccoli stir-fry if wanting to serve this to vegetarians. I have a post about how to fry plantains that might be useful if you have not cooked them before. And a little tip you want to eat this one warm as plantains fried like these are much better warm. 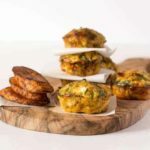 Well try this easy smoked mackerel, plantain and broccoli recipe and let me know what you think. 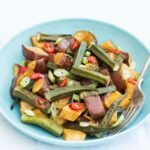 Sierra Leone flavours – is the spot on my blog where I share both traditional Sierra Leonean recipes and West African fusion recipes. 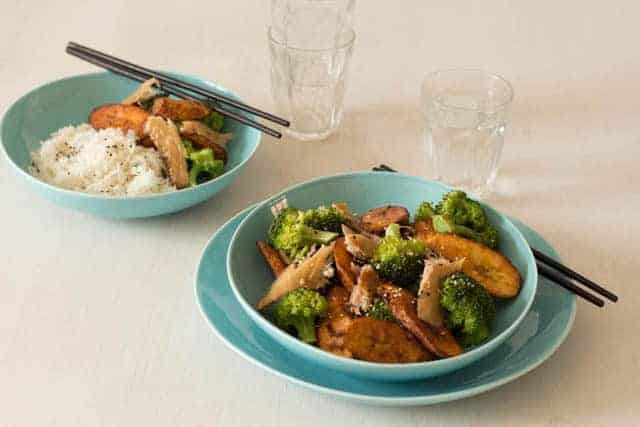 Don't forget to tag #recipesfromapantry on Instagram or Twitter if you try Smoked Mackerel, Broccoli and Plantain Stir-fry - Sierra Leone Flavours! It is really, really awesome for me when you make one of my recipes and I'd love to see it. You can also share it on my Facebook page. Please pin this recipe to Pinterest too! Thank you for reading Recipes from a Pantry. 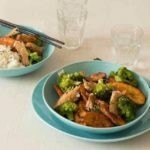 A super easy smoked mackerel, broccoli and plantain stir-fry. Mix the ingredients of the stir fry sauce together and set aside. Peel the plantain and cut into slices. Heat the oil in a frying pan and fry the plantain slices for about 2-3 mins on each side until golden brown and cooked through. You might need to do this in two batches. Whilst the plantain slices are cooking steam the broccoli for about 7 mins or until you get the softness you desire and set aside. Heat a tsp of oil in the wok and add the spring onions and stir fry for a min. 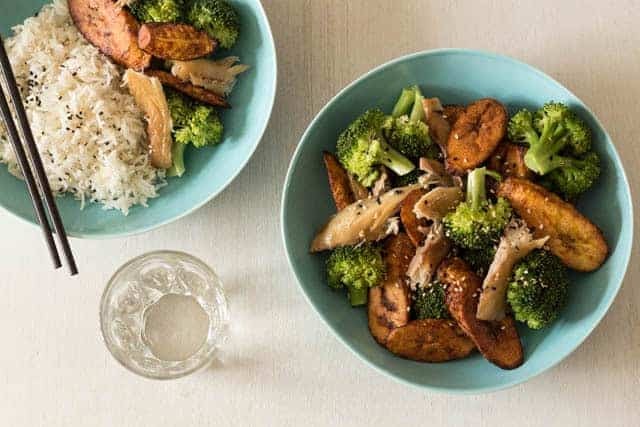 Then add in as much of the stir-fry sauce as you like, cook for a min before adding in the fried plantain, broccoli and smoked mackerel and stir fry for another min. Serve warm with some rice and toasted sesame seeds. For vegans ignore fish and add more plantain. [br]Feel free to make up more stir-fry sauce to your preference. My hubby may be one of the world’s biggest mackerel fans, so may have to give this a try. Great recipe. I know what you mean Tiny. That is one of the fun things for food bloggers. You get to change up your recipes frequently. Not a mackerel fan but I love stir fried veggies! The great thing about cooking for yourself is that you get to substitute anything you like. Brill, I like inspiring you folks. I love mackerel, the combination of flavours you picked looks lovely. Will have to try this. This is a real treat and it is so quick to make too. I just love that you’ve incorporated flavours of your homeland into this stir-fry, Bintu! I absolutely love mackerel, as well, and always used to eat it as a student in the UK … it was always so cheap for a start! What a great combination of ingredients you’ve used here! I ate smoked mackerel lots at a student too. 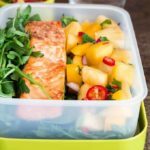 A cheap way to add protein into your meal. This looks like an incredible dish! Gluten free too and if no mackerel then an easy vegetarian dish. I’m laughing real time here. I can just see you going round Brixton Market buying up the shops! You have no idea. I stop only when I cant carry things around anymore. YUM! I’ve never cooked with plantain, actually I’m not sure I’ve ever eaten it either. Must rectify that asap. PS that’s a LOT of stuff to fit in one backpack – it must be HUGE! Yeap. I have one of those airline carry on ones. I hope you get to try it Julie. I like that you think this is a real Bintu dish. I’m not sure I’ve ever eaten plantains Bintu. All those Sierra Leone flavours sound so vibrant and delicious. Plantains are kind of like big bananas but sooooo much better in my opinion. I always love the way you fuse these flavors!! LOVE!! Thanks Zainab. I want to eat more salone foods in y diet and this is the way I can d it. I am the same with visits to Wembley. Though mine is a bootful of loot vs a bagful. 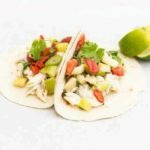 What a very different and flavorful, healthy recipe! I love it and will try soon! Thanks. Love your posts.